Produced in the sixteenth century, the treatise called Splendor Solis (The Splendor of the Sun) or Sonnenglantz, is written in German and describes the main steps of the philosopher’s stone, a legendary alchemical substance said to be able of turning metals such as lead in gold. This manuscript is remarkable for the alchemical illuminations it provides. The work is illustrated by a series of 19 illuminations, which made this manuscript extremely influential in Medieval science. It was copied in several manuscripts and printed books from the middle of the sixteenth up to the eighteenth century. The treatise of the Splendor Solis, probably made in the years 1531-1532 and preserved in Berlin, Kupferstichkabinett, as Cod. 78 D 3, is the oldest example of an alchemistic treatise. For a long time the treatise has been attributed to the legendary Salomon Trismosin, apparently the teacher of Paracelsus. The name of Trismosin appeared in copies of the Splendor Solis later than the sixteenth century, period of production of the manuscript in Berlin. The author of the treatise cannot be identified with certainty; however, the text is of major importance because it provides clues on the ideas circulating in sixteenth-century Europe about the alchemic processes of transformation of matters and their meanings. The Splendor Solis in Berlin was probably produced in a workshop in Augsburg. The illuminations are set in ornamental borders and niches, showing a layout traditionally found in Books of Hours. 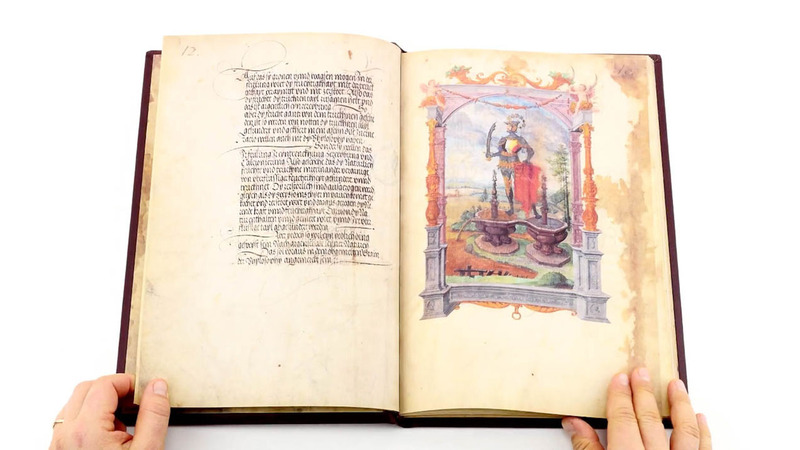 The extraordinary decoration of the book represents astronomic images, with personifications of the planets, along with matters of alchemic contents. The rich iconographic display includes miniatures on the spiritualization of the bodies, the process of drying materials, and a series of flasks filled with alchemic symbols such as peacocks and dragons. Manuscript book on parchment − 34 × 23.5 cm − 82 pp. Full-size color reproduction of the entire original document, Splendor Solis: the facsimile attempts to replicate the look-and-feel and physical features of the original document; pages are trimmed according to the original format; the binding might not be consistent with the current document binding.